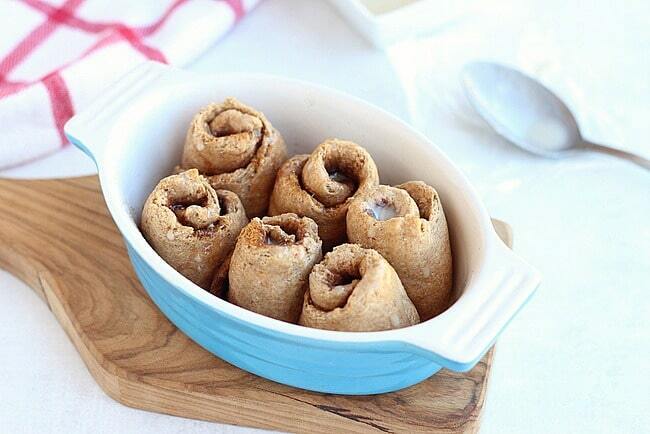 Delicious, yeast-free cinnamon rolls that are made with whole grain spelt flour. 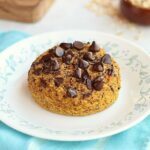 Low in sugar, vegan-friendly, and healthier than the classic! Oh man, I’m excited today. Excited to share my latest, awesome, low sugar creation with you, that is. Cinnamon rolls!!!! I have probably made this recipe a dozen times in the last week, trying to make sure it’s perfect and never tiring of the taste-testing. My husband is gaga over these, and I too am thrilled with the results. Most cinnamon roll recipes are full of sugar and/or yeast, neither of which I handle well. As usual, my indomitable craving turned into a full-blown, tunnel-visioned objective, which ultimately led to today’s deliciousness. 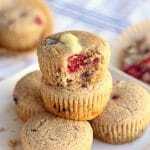 There is NO added sweetener in the dough portion of this recipe and only a modest amount of coconut sugar in the filling. This is also a small batch, suitable for about two people. Like I’ve mentioned before, small batch and single serve treats work better for us! For my husband, I make a little glaze with organic powdered sugar and coconut milk, but the kids and I generally eat these naked. The bread puffs up nicely, and the bake time is particular, so watch it if you make these. At 12 minutes, the bread is puffed, and the insides are doughy to the point of almost being undercooked, which is not necessarily a bad thing. As they sit for a minute or two, this improves. 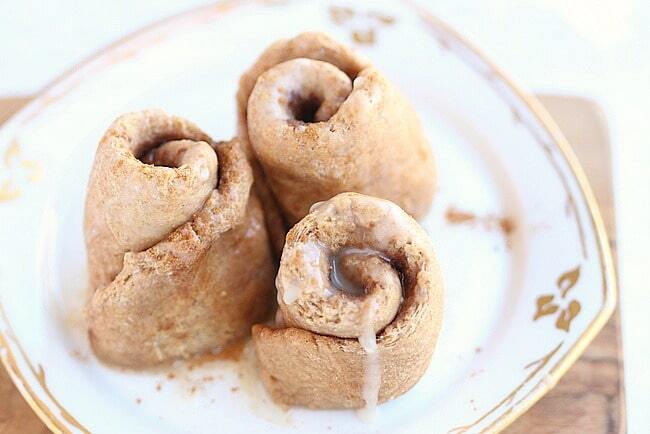 However you make them, I hope you enjoy this small batch of healthy cinnamon rolls! 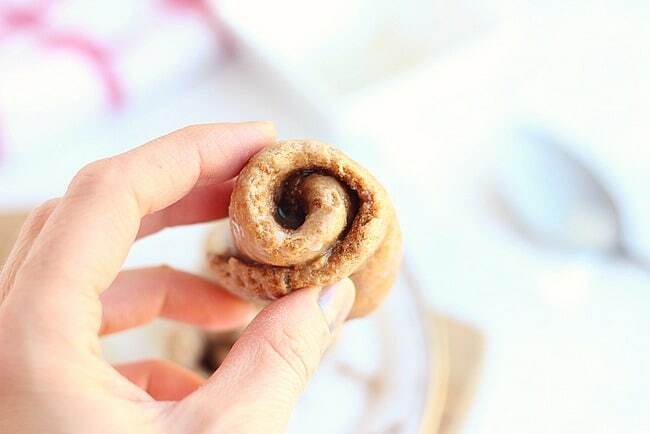 A small batch of cinnamon rolls made with spelt flour! Low in sugar and yeast-free. Cut in the applesauce so that the mixture looks 'pebbly'. Stir in two tablespoons of milk, vanilla, and vinegar, adding extra milk if needed. The ingredients should all be moistened, but NOT sticky. If it happens to get too sticky, just add a bit more flour. In the meantime, stir together the sugar and cinnamon in a small bowl. 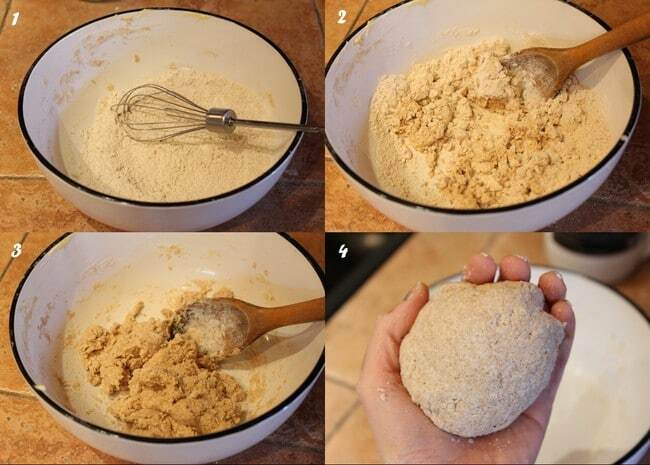 After the dough has rested, divide it into two. 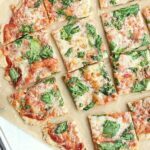 Spread each piece with 1/2 teaspoon of butter or coconut oil (if using). 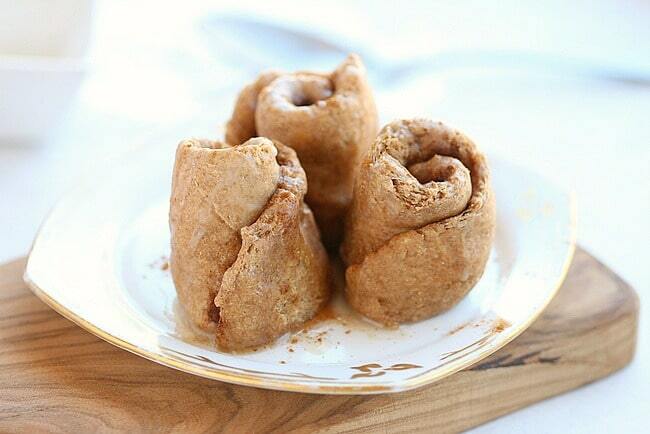 Place the rolls into a small oiled baking dish (sprinkle with any remaining cinnamon sugar). If you’re watching your fat intake, I have made these without the butter/coconut oil spread and they still turn out delicious. The spread gives them a little more sumpin’ sumpin’ though! 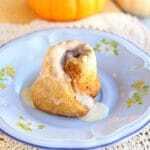 -Go the old-fashioned route with a mixture of powdered sugar and milk. See this recipe for better details. -Grind some coconut sugar to a fine powder and mix with milk for a healthier version of the above. -Spread some coconut butter on top. 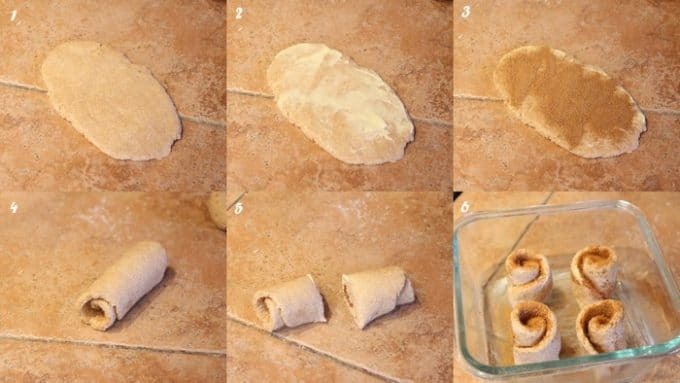 -Dunk your roll in your favorite tea or milk. 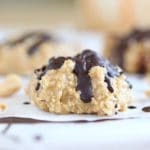 These look delicious, would a 1/4 cup of oat flour and a 1/4 cup of spelt combined work? Or would you suggest sticking to spelt? Could I add a little sugar to the dough too? I think the combo would work, and yes, you can add a bit of sugar to the dough if you like. I hope you like these if you try them, they’re my hubby’s favorite! These were super tasty. I was actually able to use a combination of oat flour and unbleached, unprocessed all-purpose flour for this and it worked out just fine for me. Thank you so much for this healthy version!! That’s great Celina, I’ll have to try it with oat flour sometime! Honestly, these are unbelievable. 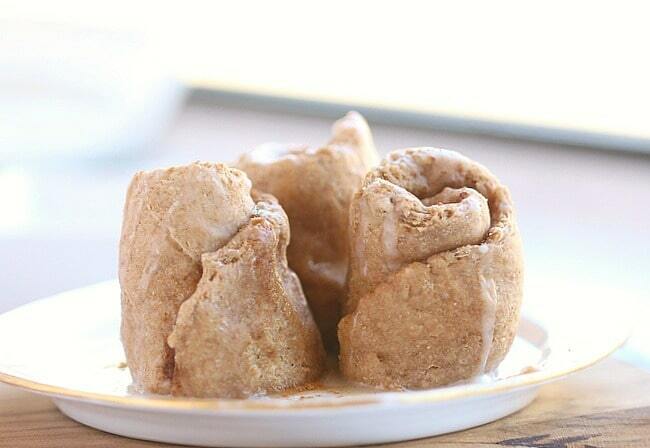 I am a lover of cinnamon rolls and these blew me away! 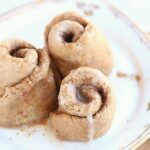 These are the healthiest cinnamon rolls in existence and they still taste like my mom’s gooey sweet decadent treats! From all the cinnamon roll addicts in the world thank you for this recipe.. Thank you for all your hard work on creating these AND for Sharon your recipe. They look AMAZING. Yum!! ? With an intolerance for spelt, is there another flour substitute that you could recommend? Whole wheat works as well. I’m not certain about any gluten-free flours though. I hope you like them Ellen! These look incredible and I love that it makes a small batch! Can i use GF Flour? Sorry for the delay Heidi, I’m not sure on the GF flour, as I’ve not tried. I’d love to know if you try it and how it goes though!